NRG Stadium is a football stadium in Houston, Texas. It is where the NFL's Houston Texans play their home games. It was known as Reliant Stadium from 2002 until 2013. The stadium hosted WWE's WrestleMania 25 on April 5, 2009. 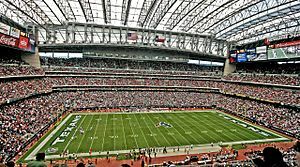 On March 19, 2014, the stadium's name was changed to NRG Stadium, after NRG Energy, the parent company of Reliant Energy. NRG Stadium Facts for Kids. Kiddle Encyclopedia.